Clothing/Jewelry Description Unknown, but she usually wears high heels. Distinguishing Characteristics Caucasian female. Brown hair, brown eyes. Chance's maiden name is Barrie and some accounts refer to her as Lorraine Barrie-Chance. Her nickname is Lee. She has protruding teeth and wears a size 3.5 shoe. Chance disappeared on January 3, 1948. That day she left her only child with a babysitter in Santa Cruz, California and said she'd return in a couple of hours, but she never came back to get her. She lived on Riverside Avenue in Santa Clara, California at the time. 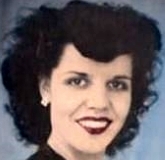 Chance applied for death benefits for her husband from the Veteran's Administration on March 28, 1948; he'd been in the Navy and had died in an accident in November 1947. Her application was approved in August of that year, but by then she had moved without leaving a forwarding address. She never collected any benefits and there's been no indication of her whereabouts since 1948. Sacramento, California police are investigating. Updated 1 time since October 12, 2004. Last updated March 31, 2016; casefile added.